This bundle consists of a complete retro arcade one player joystick and button setup, including a zero delay interface board and wiring loom. Within this kit you will get one 8-way heavy duty micro-switched joystick, 8 x 30mm and 2 x 24mm micro-switch push buttons, USB interface controller board and cables to connect everything to your PC / Raspberry Pi. No soldering is required. The zero delay interface board is designed to allow anyone wanting to build their own arcade cabinet a way to interface to arcade style joysticks and buttons to a PC or Raspberry Pi. It will allow connection for up to one joystick and 16 buttons (12 users selectable and 4 mode preset). Cables are provided for the supplied 10 push buttons and for 10 pin joystick. 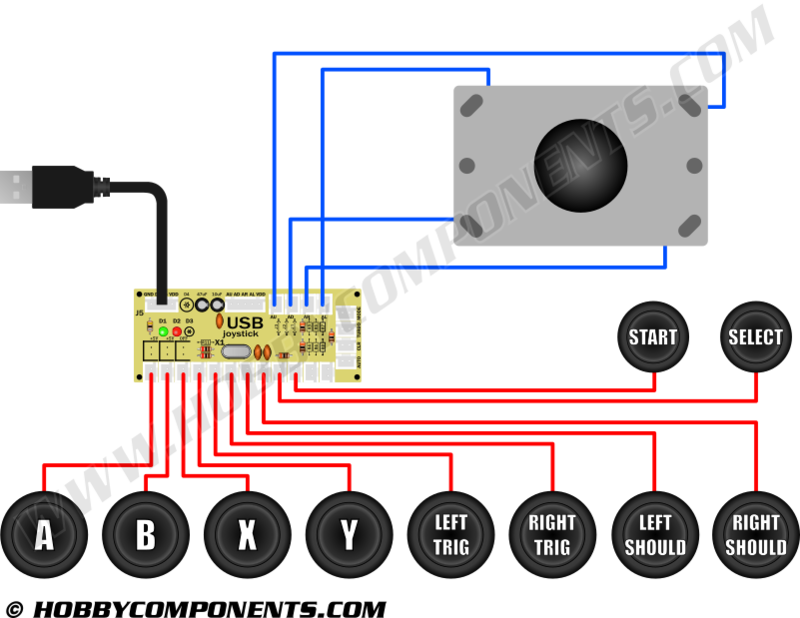 The interface board will connect to your PC or Rasberry PI via a supplied USB cable and will be detected as a generic game controller without requiring any drivers to be installed. It is fully configurable via Windows preferences or via the controller setup in EmulationStation/RetroPi. Multiple interface boards are also supported so creating a two player cabinet is as simple as plugging in a second interface board. A ball top arcade style 4/8 way joystick. This joystick uses 4 standard micro-switches to give a precise, hard wearing and positive tactile feel and allows for up to 8 directions to be sensed. The restrictor plate fitted to the bottom of the joystick helps protect the micro-switches from excessive force whilst providing full freedom of movement in both joystick X and Y directions. Should any of the micro-switches eventually need replacing they can be easily swapped out without the need for a screwdriver. A nylon ball attached to the top of the joystick gives the joystick a comfortable ergonomic feel, and a solid 9mm polished metal shaft finishes off the classic arcade joystick look and feel. For attaching the joystick to a cabinet or control panel, the joystick has a square mounting plate measuring 95x60mm with 6 mounting holes for up to M4 screws/bolts. A lose dust ring at the base of the joystick helps to cover the mounting hole and protect the mechanism below from loose dust or dirt. A set of 8x30mm and 2x24mm arcade style push buttons. These buttons are fitted with micro-switches giving a high wearing and very responsive tactile action. Two spade contacts on each button provide a normally open clean contact which can be connected to the interface board using the supplied wiring loom without any soldering. These buttons can then be configured via Windows preferences or RetroPi/EmulationStation controller configuration to perform whatever game controller button action is required.